It is with a heavy heart and optimistic spirit that I reach out to you today. 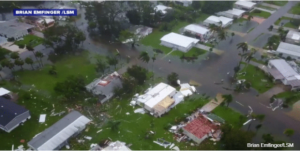 On September 10th, Hurricane Irma impacted our community that tested our resolve delivering impact winds of 142 miles per hour altering the geographic landscape of the Florida Keys, Marco Island and Everglades City. Even as South West Florida has endured the emotional and physical levity of power, water and fuel shortages, what has not faltered is our sense of humanity. Friends, neighbors and business owners throughout this trying episode continue to demonstrate solidarity, strength and sheer determination to overcome this poignant time. Personally, this experience has been overwhelming and heartwarming in the same breath. I am humbled by the great sense of compassion and generosity of time and resources given to me and everyone I have crossed paths with these past few weeks. Neighbors orchestrated a telethon to locate a hurricane shutter service for us prior to the storm. A tree service company from Minnesota who happened to be downtown on the day after the storm agreed on a day’s notice to assist in extensive debris cleanup of dozens of beloved oak trees on my street. Friends who had power before their neighbors set up impromptu “camping” evenings. Vital local businesses resumed their operations even when some had no power in their homes in order to provide relief to the remainder of us. It is these acts of selflessness that comfort and empower our greater community to keep reaching deeper until we are all facing the sun once more. Our real estate community has rebounded from this episode remarkably well as contracts that were under agreement prior to the storm remain on track to close. Further information on how this episode has affected our real estate community in detail will be provided in our next newsletter. I have truly appreciated connecting with many of you during this difficult period and look forward to keeping you informed as we progress towards a state of normalcy. Given that service in our area is still sporadic and we are primarily sharing news stories via our Facebook page. We relish in the fact that our community is dedicated to efficiently re-establishing itself with grace and ease.